If you had asked me to predict which topic on this blog would generate acrimony and criticism, I would have been hard-pressed to guess that it would have been hospital readmissions. Recall that I expressed objections to the use of financial penalties to persuade hospitals and doctors to reduce this phenomenon. Also, I cited a paper that showed that the data do not exist to fairly and accurately implement such a penalty scheme. I followed this with a post citing an article suggesting that such penalties might especially adversely affect lower income hospitals. Then, I suggested the kinds of questions that should be answered as we consider any type of public policy change. To me, this is the kind of straightforward discussion and debate that occurs on a variety of health care issues. Who would have thought that this might bring an accusation of "willful stupidity" and a complaint that "you have shown yourself even more opposed to universal healthcare than this relatively easy, low cost way to improve outcomes"? The more serious commentators, though, asked, "What would you do?" My general answer, as many of you know, is that a focus on quality and safety and clinical improvement is well within the power of each and every hospital; that such programs are consistent with sound financial planning, whether under a fee-for-service, bundled, or capitated payment arrangement; but that progress on this front demands leadership from the administrative and clinical leadership; and that such leadership must include a commitment to redesign the hospital's workflows using Lean principles or other approaches that engage front-line staff and also engage patients and family members in a respectful and meaningful way. A more conversant observer than I, Harold D. Miller, Executive Director of the Center for Healthcare Quality and Payment Reform, offered some useful thoughts on these matters in a talk he recently gave in Oregon, entitled "Reducing Readmissions: How Oregon can become a national leader in reducing costs and improving quality." I will present just a few slides from what is a very thorough presentation. First he summarized the multi-factorial nature of the problem. Next he gave a summary of the kind of work that is currently being carried out. He included lots of examples that I do not have space for here. 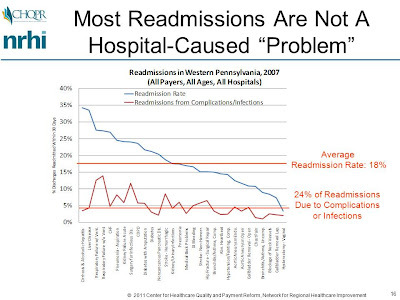 Then he pointed out that a big percentage of the readmissions are not caused by hospitals. 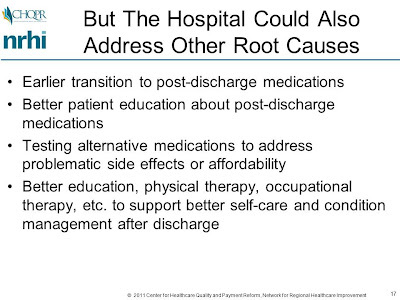 Nonetheless, he explained that hospitals could have a role in reducing the number of readmissions. In the final slide in his presentation, he gave a work plan for those hospitals wishing to make a difference in this arena. I particularly like the last bullet. I wonder if hospitals would be willing to publicly report readmission rates broken down into logical groupings such as patients with CHF, COPD, and asthma; patients with mental illness, those who underwent a surgical procedure and long term care patients who experience repeated falls or are sent back to the hospital frequently because it’s the path of least resistance for the SNF. Hospitals could include their own verbal color to supplement the raw data in ways they consider meaningful and relevant. This could be similar to the “Management Discussion and Analysis” section of corporate annual reports. Data broken out by socio-economic status (Medicaid eligible or not) and age (over or under 65) might also be relevant. Even if it would still not be possible to make pure apples to apples comparisons among hospitals, the public could at least track trends at individual hospitals and see how the metrics stack up against other “similar” hospitals – AMC’s, community hospitals, suburban and safety net hospitals, etc. I agree that this form of transparency could be helpful. It would establish the kind of creative tension that is essential to process improvement. I think the government is using it's muscle to encourage just that approach. 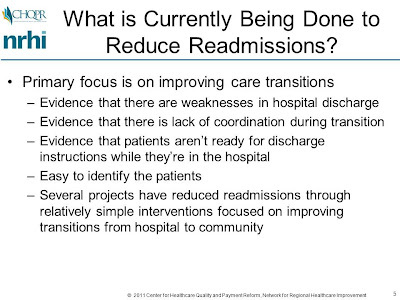 They are using readmissions as their metric - I think the "what would you do?" question is more of a "what metric would you suggest?" or "what penalty would you suggest?" because I think you know that there are some hospitals out there that will only respond to penalties and threats. So when I say, "what would you do?" I mean that in the most specific sense. The Feds have given us their answer. Come up with a better concrete answer to the issue of poor health outcomes after hospital stays and I think they will be willing to listen. But I'm not seeing a lot of specifics here and a general focus on quality and safety will spawn committees but little else in many environments. Parts of the NHS (as well as other systems in the world) have been learning through experience about these types of improvement systems for several years (and decades) now. For example, http://www.nelm.nhs.uk/en/NeLM-Area/News/2011---March/03/Kings-Fund-report-Reconfiguring-hospital-services--lessons-from-South-East-London/. It may be useful to review what has happened in other publicly funded health systems, so that we can consider the possible unintended outcomes and successes of implementing these types of hospital improvement systems. No one can argue with this comment: "My general answer, as many of you know, is that a focus on quality and safety and clinical improvement is well within the power of each and every hospital"
The real question is why so many hopitals are not plowing forward on every front. For the most critically ill...the "outliers" who consume about 80% of health plan dollars...there are gross variations between tertiary centers in terms of quality, outcomes, net cost, and death rates. Many of the outliers can travel. My proposition is not to wait for tertiary centers to improve themselves, but rather for plan sponsors to provide incentives to select patients to go the best. When laggard hosptials and clinincs start losing patients, then they will make needed improvements. Thank you for raising a very interesting topic. There are times to create incentives and disincentives, but there is a danger with this model, especially if one's culture is dysfunctional, autocratic, and a little "too command and control." To me, creating punishments for readmissions will lead to bad things, such as not re-admitting someone who really needs it. Seems like a similar strategy that a Chinese judge used in punishing a good Samaritan for helping out someone by forcing them to pay the medical bill. The end result: 16 people passing by or looking the other way as an injured child lay in the street, which sadly resulted in her death. 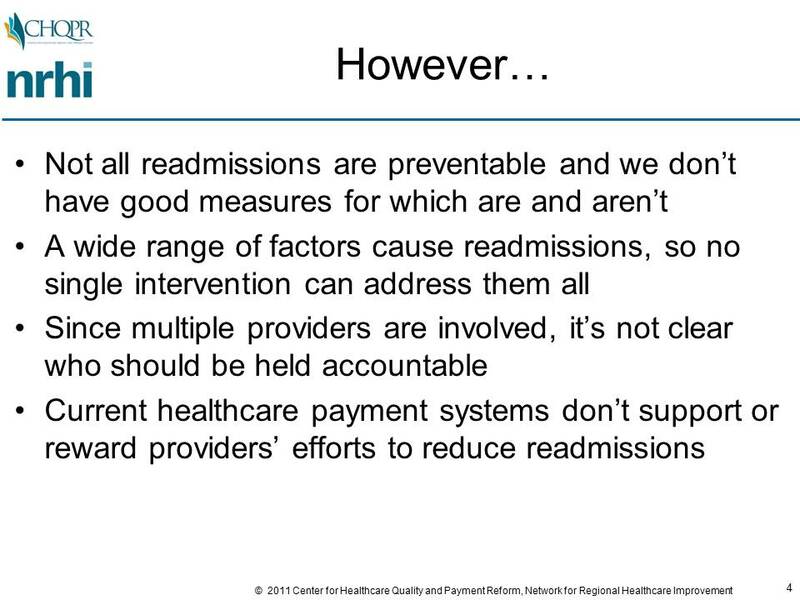 Readmission punishments have the potential to do more harm than good. I like the idea of transparent measures and conversations much better. I am struck by your zeal to punish, even when it has been demonstrated by these posts that you can't properly measure what you purport to punish, that you are likely to punish those institutions with limited resources, and that the functions about which you care are often not related to hospital activities. Thanks for your thoughts. Anon 1:20 provides a partial answer. 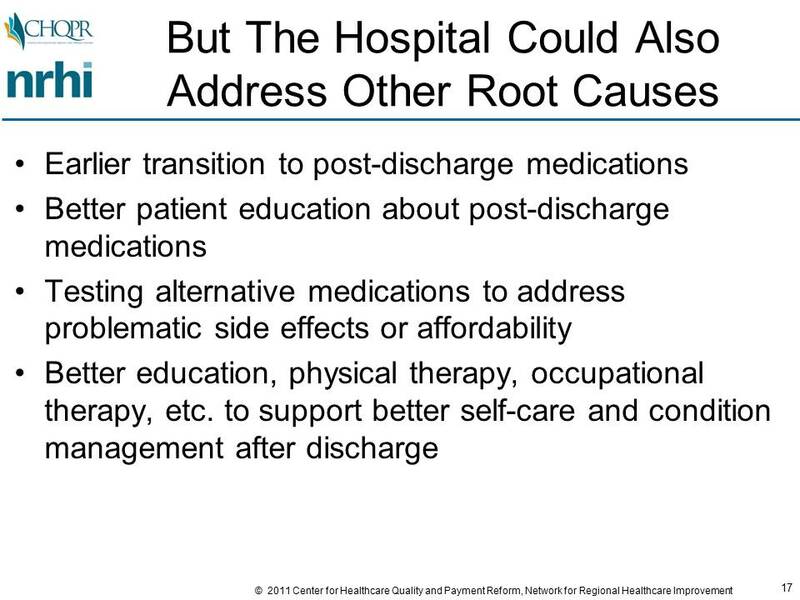 Hospitals often do not plow forth on "every front" because they are often bombarded with regulatory requirements that distract them from the things that matter and required to put efforts into many things that do not. That being said, it is clear that there are laggards. When I was pushing for transparency to cause improvement in the death-causing central line infections and ventilator associated pneumonia, I was opposed even on that front by many of my peers. With time, though, through peer pressure, the importance of these items became clear and efforts began in earnest -- even without financial penalties. Paul, I think you and Harold Miller are absolutely right. 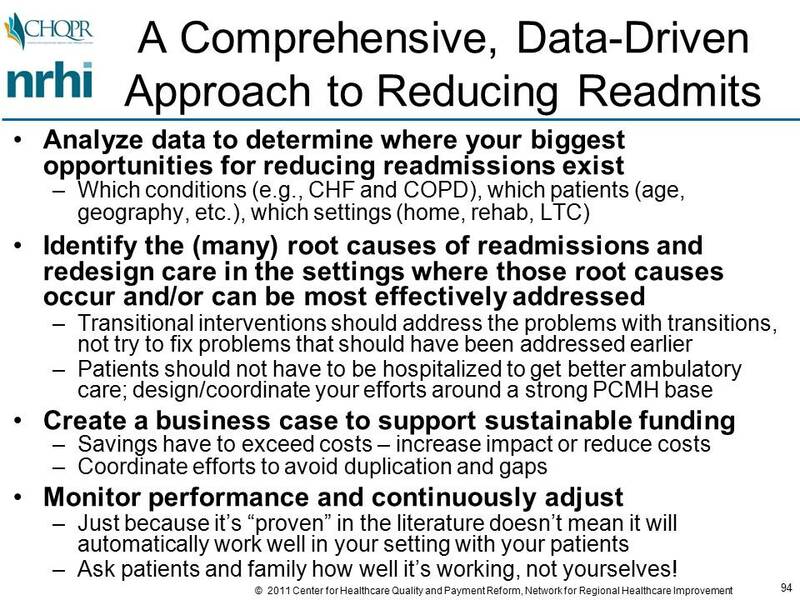 Preventable readmissions are a community-wide and system-wide problem – We cannot simply lay responsibility solely on hospitals, even if it’s convenient to do so. 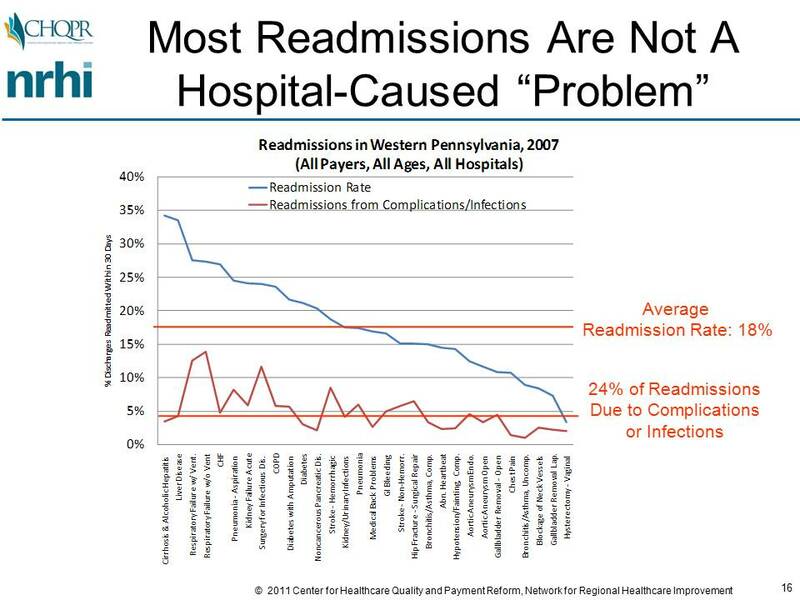 The fact is there are many instances when readmissions are the result of actions (or inactions) that are completely beyond hospitals’ control, and it makes no sense to impose financial penalties on hospitals when responsibility for a particular readmission lies elsewhere, or is impossible to determine. That is why we are so surprised that Medicaid has proceeded to impose readmission penalties upon hospitals without a sound scientific basis for doing so. Here in Massachusetts, more than 50 of our hospitals are engaged in formal improvement efforts to reduce preventable readmissions via programs like the STAAR initiative and the RED and BOOST projects. MHA continually posts information about these and other quality improvement efforts on the PatientCareLink website we co-sponsor with the Organization of Nurse Leaders of Massachusetts and Rhode Island. 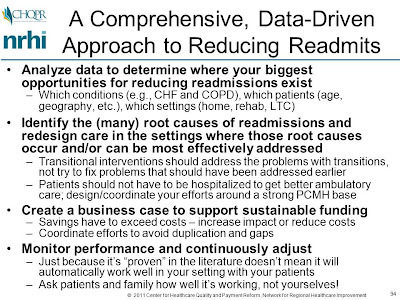 We are learning that reducing readmissions is complex work that takes both time and continual vigilance. It also needs participants from all along the healthcare continuum. Some of our hospitals have been working on this issue for nearly two years but still haven’t seen marked drops in their readmission rates. We do need sustained hospital leadership buy-in, action and focus, but we also need the engagement of myriad community care providers and active involvement of patients and their families. 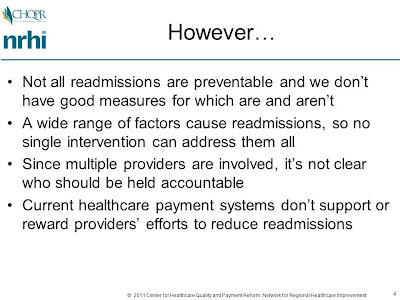 Hospitals on their own will not be able to put a much of a dent in readmission rates. It’s going to take the whole healthcare village. A bit late to the party, but I finally got around to reading Dr. Miller's excellent presentation in its entirety. One could nitpick, such as pointing out that the things that Geisinger offers a warranty on are mostly surgical conditions which should have low readmission rates anyway, in contrast to the frequent flyers like heart failure or COPD with pneumonia. The project in Pittsburgh that I described in the presentation started in 2007, long before there was even a hint of federal penalties. But it was only possible to do it because a local foundation was willing to provide the funding for the nurse care managers and the coaching; the local health plans wouldn't (and still won't). 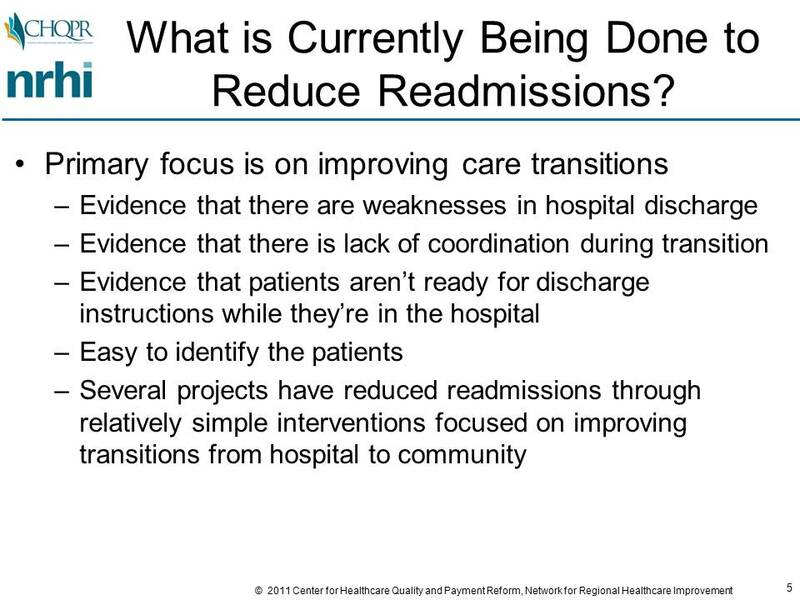 Many other efforts to reduce readmissions started long before there were federal penalties; there wouldn't be evidence that Care Transitions, Project RED, etc. work if they hadn't started long ago. The key question is what is the barrier to replication? Is it a lack of willingness or lack of ability (i.e., the fact that payment systems don't pay for the things that will reduce readmissions and remove all the revenues when they are reduced). If you think it's merely lack of willingness, or outright resistance, then penalties may be necessary. But I think the problem is that the payment system needs to support the right things. The Medicare penalties leave all the problems with the payment system untouched - PCPs still can't get paid for hiring a nurse to work with chronic disease patients, and hospitals still lose all the revenue associate with a prevented readmission even though they don't lose all the costs - and simply adds a relatively small penalty on top of that. It's not an issue of carrots vs. sticks; it's not that doctors or hospitals need "incentives" to help patients stay out of the hospital. It's a matter of paying the right amount for the right thing. How bare should the bare essentials be?